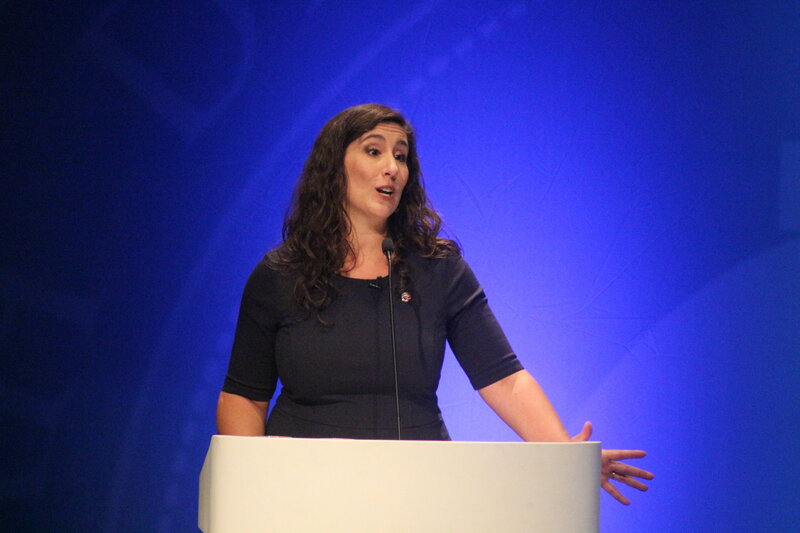 ST. GEORGE – The conclusion of a congressional candidate debate Monday between Republican Rep. Chris Stewart and Democratic challenger Shireen Ghorbani was interrupted by a man who got on the stage and hijacked Stewart’s microphone. 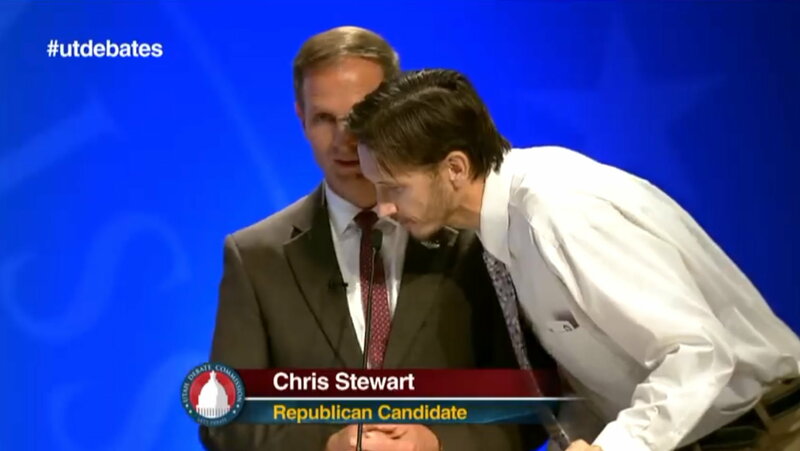 Stewart was giving his closing remarks during the Utah’s 2nd Congressional District candidate debate hosted at Dixie State University, when the man suddenly walked on stage, leaned over in front of him and shouted “Vaccines cause autism” twice before being escorted off stage by police. Following the incident Stewart told reporters he thought the man was a technician who was needing to fix his microphone. According to Washington County booking information, the man who interrupted the debate is Corbin McMillen, of California. He was arrested by DSU police and has since been charged with a misdemeanor for disrupting a public meeting. McMillen’s hijacking a microphone wasn’t the only disruption at the debate’ however, instances of clapping, booing and one other man shouting at Stewart from the audience were more benign by comparison. 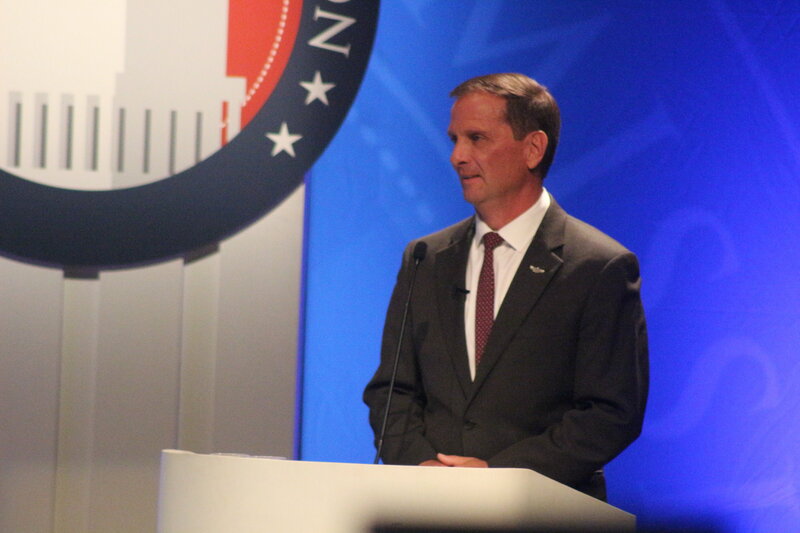 The moderator, Deseret News editor Doug Wilkes, repeatedly asked the audience to refrain from continued outburst of applause and booing so the candidates could have more time to speak. Ghorbani said health care is a primary reason why she got into the congressional race. She shared that the experience of her mother dying of cancer in 2016 was a motivating factor and calls for affordable health care reform. Stewart said many of the problems lie with former President Barack Obama’s Affordable Care Act. Many promises made concerning Obamacare have been broken, he said, and the price of care keeps rising. “Under my plan, a Republican plan, no one can be denied coverage,” Stewart said, adding the plan includes increased funding for women’s health programs, cost controls for insurance policies, the ability to buy insurance policies across state lines and other reforms. “Sounds like Obamacare,” Ghorbani responded, prompting applause from supporters. Allowing Medicare to negotiate drug prices and transparency in hospital billing are two items Ghorbani said she is pushing for. She also accused Congress of not passing meaningful reforms due to the influence of pharmaceutical companies. Among questions posed to the candidates from the local community was in regards to the Lake Powell Pipeline. “Water is a very truly present issue,” Ghorbani said, adding she did not believe enough concrete research has been done yet to warrant her support. She wants to know what the overall cost of the pipeline will be – preliminary estimates place it at between $1.3 billion and $1.8 billion – and if it is actually needed. There is support for water conservation in Washington County, she said, and the final price of the pipeline plus its impact on county residents need to be known. Stewart said he supports the pipeline because it’s supported by the people of Washington County, which earned him some jeers from the audience. Stewart has been trying to work with the federal regulatory agencies involved the Lake Powell Pipeline’s portion approval to get it going, he said. Ghorbani and Stewart agreed on the need to bring down government speeding and lower the national debt. Stewart has called the national debt a danger to national security and quickly mentioned it again before sharing what he felt was a bigger problem when the question was brought up during the debate. Stewart said he believes China is the greatest national security threat the country currently faces and mentioned the country’s ambitions to become the dominant world power in coming decades. Though she did not use his name at first, Ghorbani implied President Donald Trump was a threat to the country. “I’m concerned the person in our White House is not leading with the clarity of our American values in the way that we deserve,” she said. When asked if she could support Trump, Ghorbani said she would support the office of the president and wants him to do well yet is troubled by his conduct. “I’m distressed we have a president that fans the flames of division,” she said. She also stated at other times during the debate that she believes America’s standing in the world has been harmed due to Trump’s behavior. Stewart said he also supports the president and many of his policies, though disagrees with him on a number of issues like tariffs – an issue he and his challenger both agree is hurting particular Utah industries. Monday’s debate is the only one thus far held between Ghorbani and Stewart. Stewart has served as Utah’s 2nd Congressional District representative since 2012. According to a recent survey hosted on Utah Policy, Stewart has 45 percent support among Utah voters while Ghorbani garners 34 percent. Libertarian candidate Jeffery Whipple carries 5 percent, with 16 percent of voters undecided. The next major candidate debate slated for Southern Utah will be the U.S. Senate race between Republican Mitt Romney and Democrat Jennifer Wilson. It will be held Oct. 9, at 6 p.m. at Southern Utah University in Ceder City. 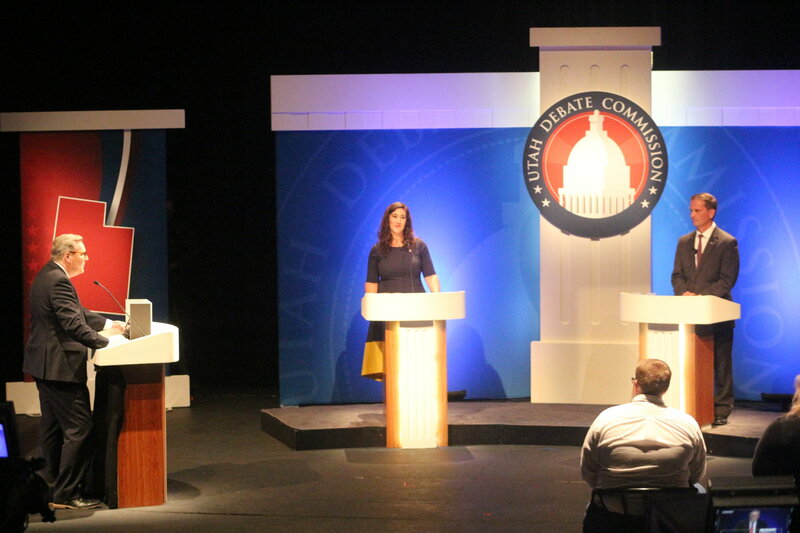 Watch Monday’s 2nd Congressional District candidate debate below, courtesy of the Utah Debate Commission. Now can we see and hear from the other candidates? Democrats in the audience are not doing themselves any favors by acting like this at debates. Would you really expect anything less from democrats? They are so dumb, they looted an Apple store to protest Trump, and Apple is in the pro-Hilary camp! Spoken like a true Utard, follow in lock step behind Trump yelling lock her up and not knowing why, just to here yourself fall in line with republican lies. About time the other side rebuffs all the GOP BS for what it is. Stewart is nothing more than a corporate shill, indebted to the military industrial complex. Hes not helping us at all. I think you meant “hear”, not “here.” Who’s the Utard now? You are correct in saying I follow Trump. We should ALL follow Trump! He has done so much good for our country. Okay, Redbud. Let’s hear just how much “good” Trump has done. I can assure you that your list will be VERY short. Oh, and, don’t try to give him credit for the economy. That belongs to Obama. You can credit Trump with stimulus but that’s all. Tax cuts? HAHAHAAAHAHAAHA!!! For the wealthiest of the wealthy. Hmmm, what else has he done? North Korea? Nope… Kim played Trump like a fiddle. Puerto Rico? Nope, he royally screwed that up. Russia? Nope, he practically bent over for Putin. I’m at a loss. What good has he done for America again? Because America was already great before Dotard J Drumpf took office. This was the first live debate I have ever been to. It was quite the adventure. It was told to us very clearly that we were NOT to clap and make noise during the debate. It is very unfortunate that there are those that do not think rules apply to them. Interestingly those that were clapping and booing seemed to be in Ghorbani’s camp. See Penn & Teller’s BS on vacinations video on Youtube. Need to hit pause button, as it presents counterpoint. (Not P&T orig video) Also watch RFKennedy Jr. on vaccines. But best thing out of this dull debate may be the warning from the protester. I’m not exactly agreeing with him, but do your homework. 2 reasons critical research is avoided on vaccine safety – From a mass public point of view they are absolutely necessary. Second reason $$$$$$. Just note the local Walgreens flu vaccination we see every year has missed it’s mark more than once and was 100% useless and ineffective against that particular strain of the flu. (DID YOU GET A REFUND?) These vaccines are a product, and failure in the manufacturing process, (perhaps a defect bypasses quality control) or a breakdown in the Supply chain, like a genset in a refrigerated truck shutting off, can result in a damaged product. Note, I am not using medical-based arguments in this commentary, I have had vaccinations, especially for travelling to 3rd world countries in Africa and Asia. However I am of the personal opinion we do not know all there is to know on vaccine safety, especially for young children. I was never given a shot with 10+ vaccines at once when I was a little kid. Not saying anything wrong, but if it were my choice, I would rather have <3 per dosage. The truth is there is not enough research being done at this time, and assuming an issue were discovered, big pharma companies would likely lose billions and billions of dollars along with a cash cow income stream. That is why little of this topic is ever seen on discussed on mainstream media platforms, and perhaps the reason tbis individual who protested felt the need to do so at the expense of going to Purgatory. Or was he just crazy? There is actually a special vaccine injury court set up by the US gov’t, and this was established to give vaccine corporations full immunity from a defective or harmful product. They’ve actually paid out billions of dollars over the years in vaccine injury cases. So no, vaccines are far from being totally safe. I won’t say for sure whether “vaccines cause autism”, but I would not be at all surprised if it was a contributor. We see a huge increase in prevalence of autism starting with those born sometime in the early or mid 90s. Something changed during that time. It could very well have been vaccines. Some common sense things would be ending combination vaccines and spacing them apart over a time and only giving 1 at a time. Yes, this would add hassle and expense. The problem is that humans are viewed as cattle by pharma, and pharma owns much of the gov’t. They are only interested in $$$. He was just crazy. In my opinion, parents who don’t vaccinate their kid are stupid. I’ll say it again; not vaccinating your kids is just plain stupid. Personally, I would rather have my kid get autism and live then die from diseases like Polio, Small Pox, Typhoid or Pertussis. And anyway, what does Mr. Stewart do for anyone but the rich–his rich cronies? What does he do for average utahns who have to work for a living and don’t live in multi-million dollar houses. I’d really like to know. I have a legit question, is Shireen Ghorbani a man or a woman? I have one too. Are you an idiot or are you an idiot? Hint: there is no wrong answer. Comments, you’ve always been one of my favorites. You always help me stir the pot here on the news website haha! Stewart spoke out against “entitlements,” (Social Security, Medicare) programs we have paid into for years. Raising the age of full retirement while corporations get huge tax breaks that have increased the national deficit. Doesn’t sound like Stewart is working for his constituents. Ghorbani is not accepting donations from corporations & those with strings attached. Stewart has been part of the swamp, let’s drain him out! PS I am not hiding under a made up moniker. All the other stuff aside…..I was there and as it became clear this guy was not the Congessman’s aid or something similar, I was disturbed about security. This particular guy was a bit odd but pretty harmless. It could have been much worse and should not have been allowed to happen.